"What's that leaning against your fence?" My Franklin. Not vintage but maybe classic. 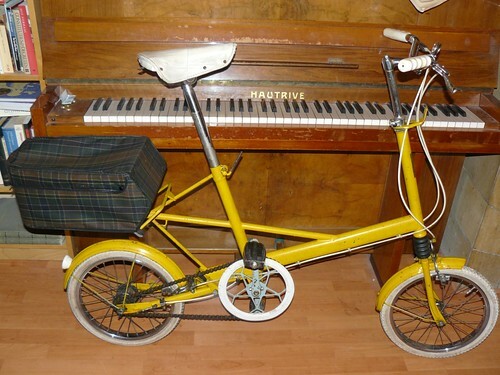 It's supposed to be the bike I would have had, had I been into this sort of thing back then. My decidedly C&V piano, 1910, Hautrive, very light action steinway-esque mechanism, pretty ivory keys with a horrid yellow lump of english pigiron in front of it. Just got home with this. 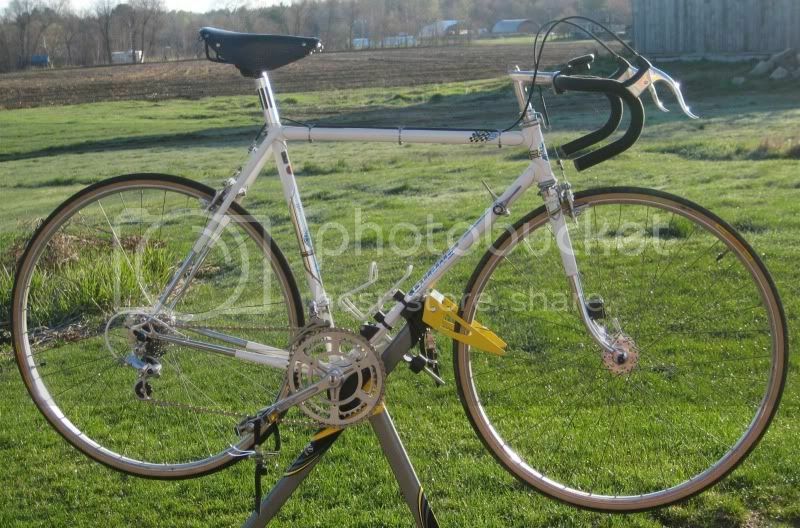 1985 Trek 520. Reynolds 501 tubes. It appears to be all stock which is kind of a disappointment. 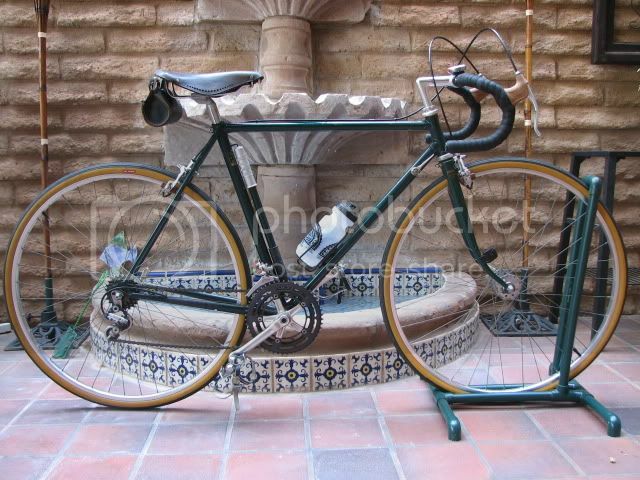 I wanted to cold set the rear to accept 130mm hubs and put a modern group on. Now I might want to keep it stock. The tires are dry-rotted pretty bad and the brake pads seem brittle. This is my other offering. 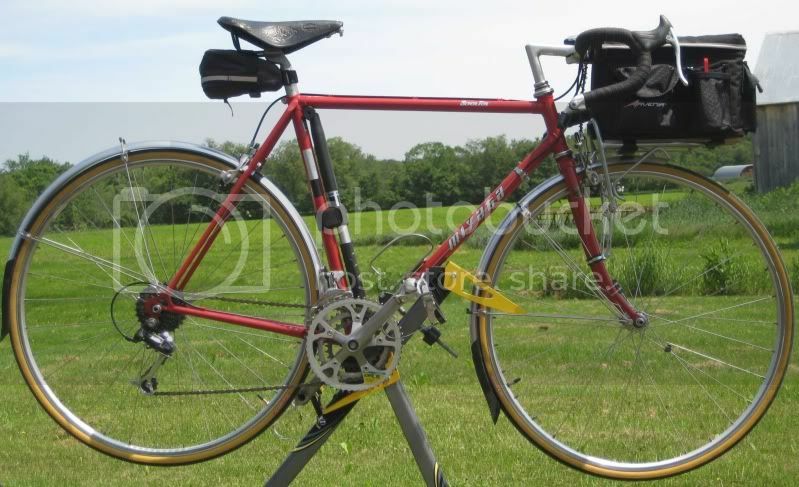 1988 Trek 1200. 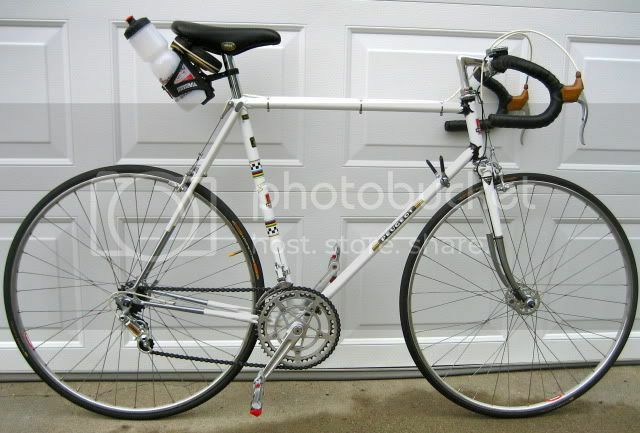 The aluminum sure beats me up on the rough Milwaukee streets (which is why I picked up the bike above). BTW, the Soma Everwear tires are excellent for heavy urban cycling. You know, I could swear I've seen two frames just like these hanging around bigbossman's garage once upon a time. Could it be they both up and traveled from Chez Bossman to the same locale? 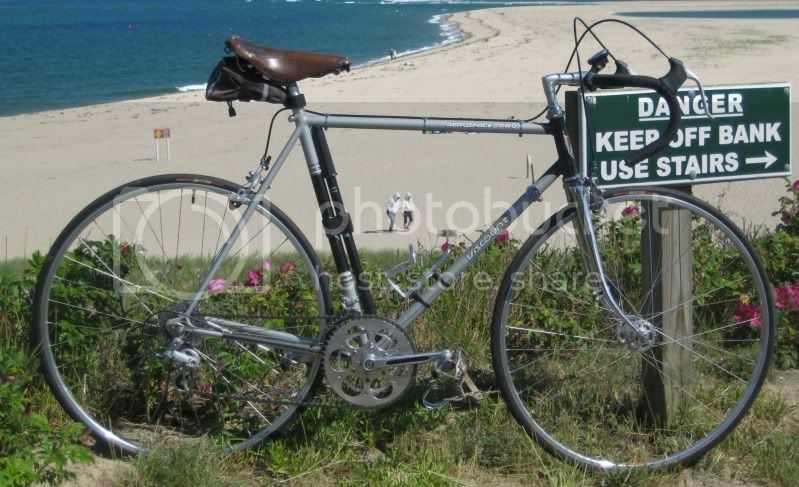 Naaaah, it can't be - no one would buy from BBM twice . . . .
That Moto looks like it's resting at the Chatham light!!!! nlerner had posted it to the list when it ran on CL. 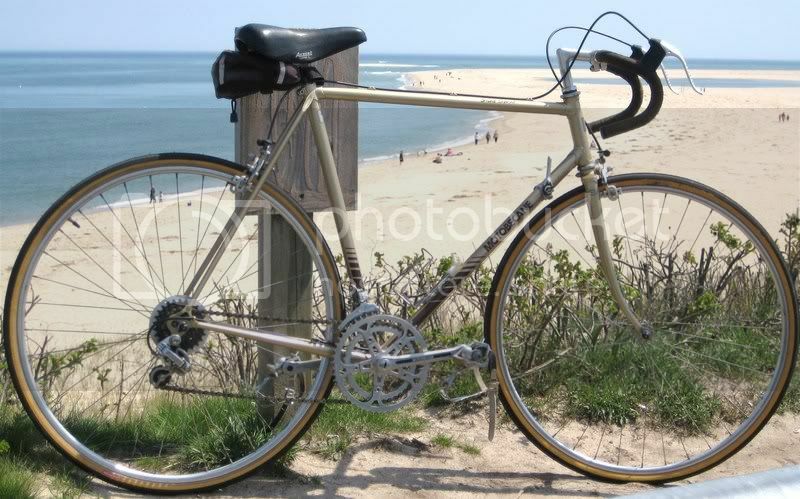 I contacted the seller, did the deal, and had the guy in Hyannis drop it off at my parents house in Chatham on his next delivery run there. I like that spot, and try to shoot all the 'Official portraits" there. 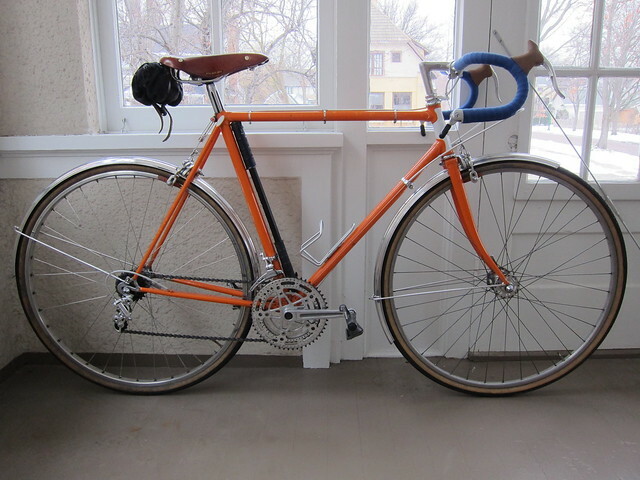 My 1981 Ron Stout, mixed build, have been a few changes since these pics, but you get the idea . . . Still not satisfied with those fenders, they just don't fit quite right. I always enjoy seeing this bike! Yeah it looks awesome. Very vintage-y looking. Thanks for the compliments. 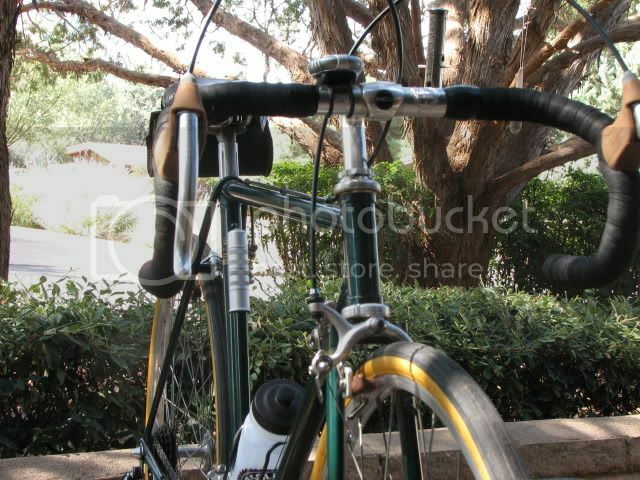 The bike frankly looks best from a few feet away, but it's a great rider. Last edited by Petey123; 08-29-11 at 01:04 PM. 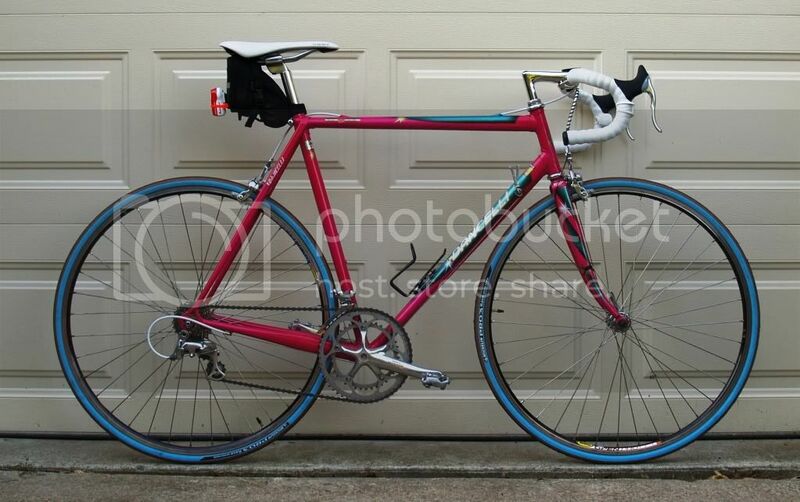 Jack Taylor Super Tourer Tandem (FOR SALE), Jack Taylor Tour of Britain, Px-10, Carlton Flyer, Fuji The Finest, Litespeed Classic, Salsa Fargo, Santa Cruz Tallboy, Cetma Largo (FOR SALE), Riv Betty Foy (wife's), Gitane 500A Mini Racer (FOR SALE), . Naaaah, it can't be - no one would buy from BBM twice . . .
Actually, more than twice if you count wheel sets! I'll play. 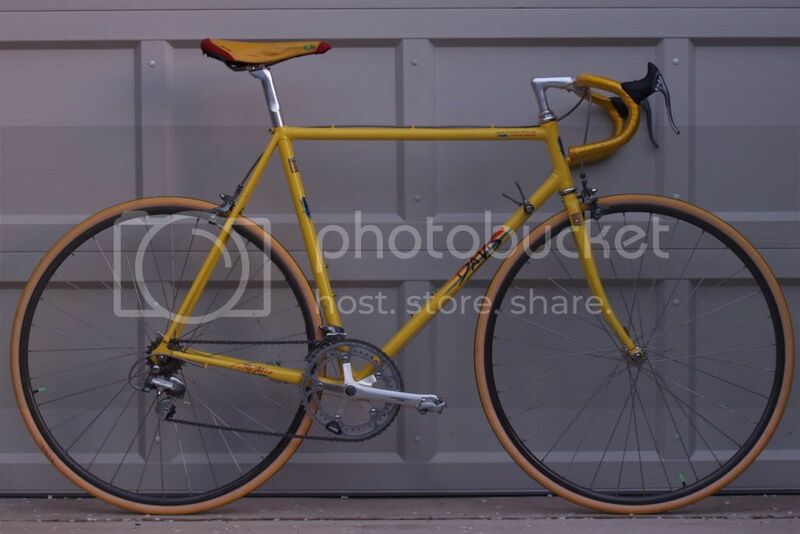 Peugeot PX-10 ~1973, as recently ridden for several club events. 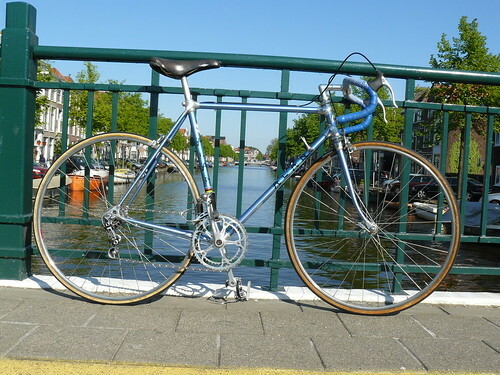 Custom built Dutch/Belgian with Italian components, ~1985. 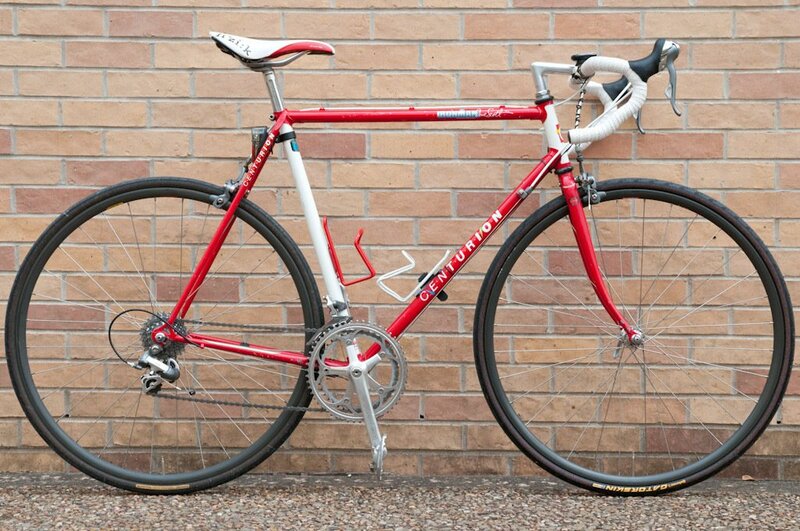 As ridden for club training rides, TTs, and several duathlons. Those levers are crazy low! 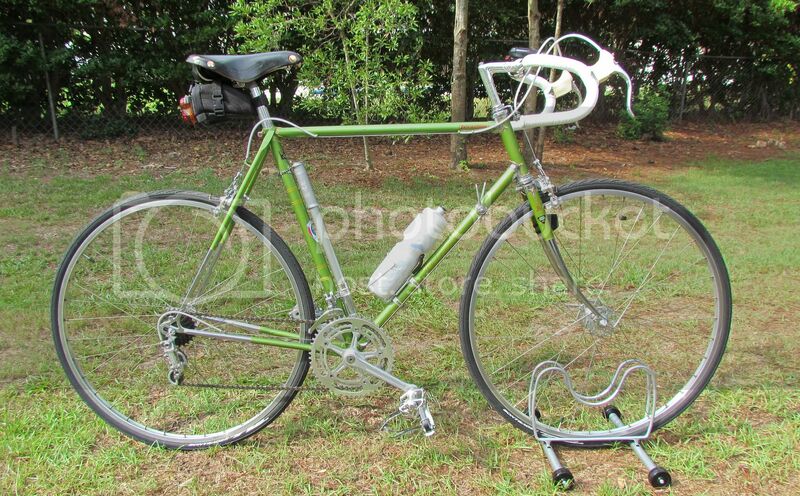 This is my Raleigh Super Course. I bought in new in 1968 for around $130 with money I saved doing chores and helping a friend with his paper route. I was 13. 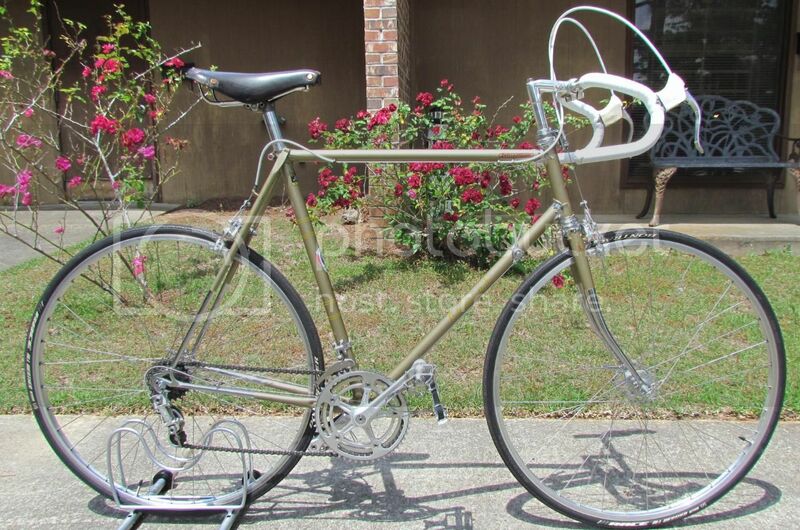 Sometime in the late 70s, early 80s, I stripped it down, repainted it and updated the components with what I thought was cool and affordable for me back then. I kept the Weimann hubs but had to build them up on new Araya rims. New Shimano 600 cranks and BB to replace the cottered originals. New Shimano 600 headset and Dura Ace front derailleur. Suntour Cyclone rear and Dia-Compe Gran Compes for stopping. 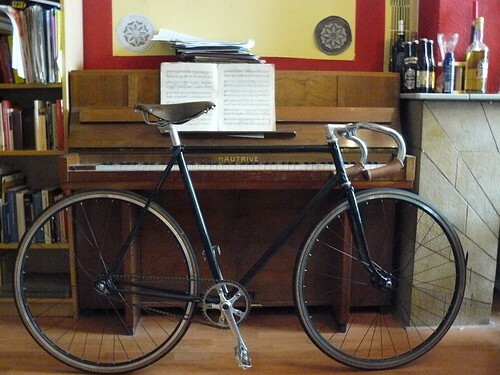 Pedals, stem, handlebar...new. Kept the saddle. Its a mish-mosh, but it works. 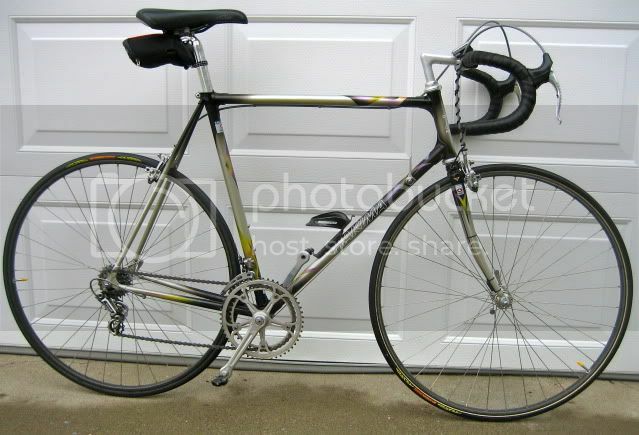 Been in that position from the factory, or when set up initially by the LBS (bike purchased by my brother who passed it to me). Lizard Skin tape covers the original intact black wrap. I suppose I could rotate the bars up a bit, but have left it as is. 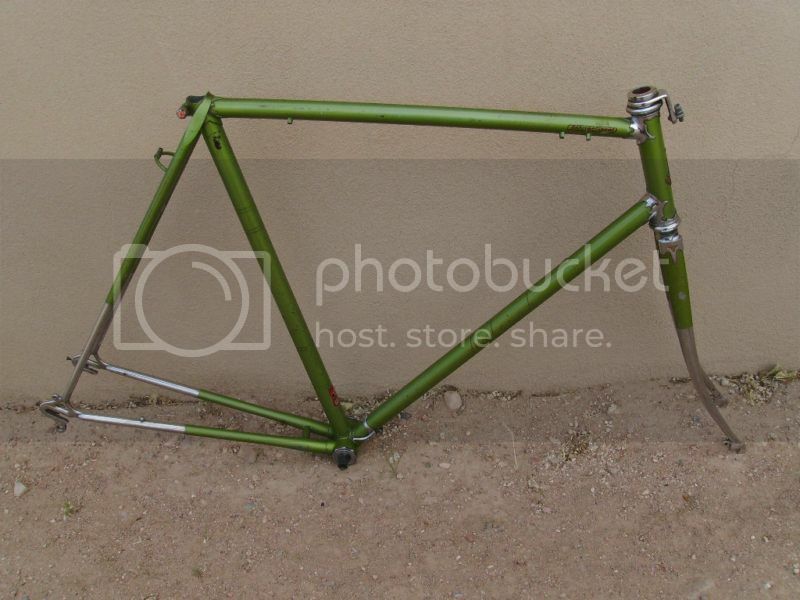 Probably could lower the stem as well, but it rides fine.